The average sales price for a home in Darien increased by 13 percent in the last quarter of 2017 versus the same time period in 2016 (the median sale price increased by 9.2 percent increase for the same time period). This home at 9 Clocks Lane, offers new construction and a lower maintenance lifestyle. The builder of this home is working on multiple projects in the area. 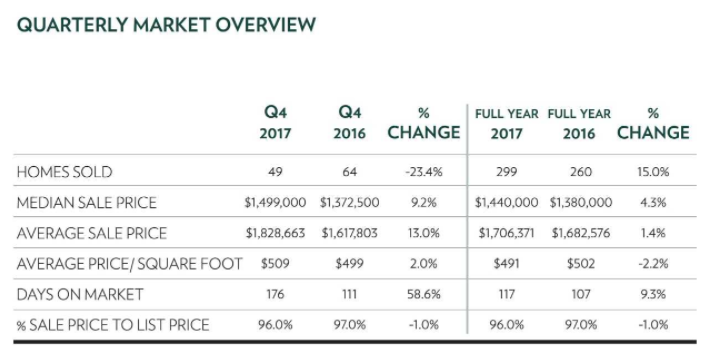 Overall, the average sales price for a home in Darien rose by 1.4 percent in 2017, from $1,682,576 to $1,706, 371 and sale prices averaged 96 percent of list prices. Buyers continued to place a premium on newly constructed or recently renovated homes in 2017, choosing a lower-maintenance lifestyle. They also demonstrated a strong preference for homes in areas close to town, trains and schools. Trends in the real estate market in 2017 reflect high levels of inventory in the luxury categories. 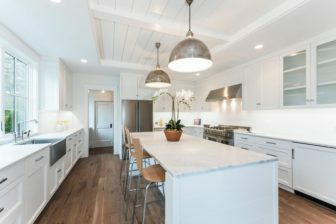 The number of homes on the market priced between $3 million and $5 million increased by 43.8 percent and the number of homes priced at $5 million and higher rose by 70 percent. The highest demand was seen in the $500,000 to $699,999, and $1 million to $1.5 million price ranges. The number of homes sold went up by 15 percent in 2017, although the number was down in the last quarter versus the last quarter of 2016. Diane Farrell is a realtor with Houlihan Lawrence in Darien. A 20-year town resident, she is a board member of the Tree Conservancy of Darien. Her marketing and public relations business, Farrell Marketing and Media is based in Darien. You can reach her at dfarrell@houlihanlawrence.com or (203) 984-0644. A historic home can offer a one-of-a-kind experience for a buyer who can appreciate it. When you walk through the doors of this house for sale at 40 Swifts Lane in Darien, you realize that you are being transported back in time, to an age when things were tremendously different. Here’s Deirdre McGovern’s report on Darien and Rowayton real estate Dec. 7 to 14, 2017: This week's Darien highlights: 0 New to Market Listings in Darien 1 Price Reductions in Darien 1 Accepted Offers in Darien 6 Closed Sales in Darien 0 Open Houses in Darien This week's Rowayton highlights: 0 New to Market Listings in Rowayton 0 Price Reductions in Rowayton 0 Accepted Offer in Rowayton 1 Closed Sales in Rowayton 0 Open Houses in Rowayton Price Changes Address Town Original Price Previous Price Current Price 31 Buttonwood Lane Darien $1,895,000.00 $1,850,000.00 $1,825,000.00 Accepted Offers Address Town Latest Asking Price 23 Rocaton Road Darien $1,675,000.00 Title Passed Address Town Listed Price Sold Price 23 Patricia Lane Darien $2,395,000.00 $1,830,000.00 10 Harbor Road Darien $1,850,000.00 $1,499,000.00 10 Rocaton Road Darien $1,250,000.00 $1,222,500.00 74 Gardiner Street Darien $1,495,000.00 $1,185,000.00 2 Phillips Lane Darien $1,150,000.00 $1,085,000.00 38 Edgerton Street Darien $869,000.00 $847,500.00 9 Little Brook Road Rowayton $850,000.00 $700,000.00 — More about Deirdre McGovern here ___________ See also: Darien & Rowayton Real Estate Report: Dec 7 to 14 (Dec.